From Fresh Prince Of Bel Air and The Jamie Foxx Show ALEX THOMAS, + Greg Wilson & Darren Carter! Actor/Comedian Alex Thomas was born in Los Angeles, California. He grew up with a musical background. His mother a classical pianist and his father, Alexander Sr., was a member of one of the greatest band in R&B history, Earth, Wind, and Fire. Because of Alex’s height and size, sports did not work out in his favor. So, growing up in the ‘hood, the only other alternative was telling jokes. He was the Class Clown from Kindergarten until he graduated the 12th grade. Right after high school, he landed his first job in the entertainment business on the hit comedy show, In Living Color. I guess you can say, Alex went from high school straight to the pros. Believe it or not, he wasn’t hired as a comedian or an actor; but as a dance choreographer for the infamous Fly Girls. It was on the set of In Living Color, where he met Keenan Ivory Wayans and Damon Wayans, that he was persuaded by the family to pursue a career as a stand up comedian, and the rest is history. Two years later, Will Smith found Alex Thomas performing at the world famous Laugh Factory Comedy Club in Hollywood, California. Smith hired Alex immediately as a writer on his hit sitcom, The Fresh Prince of Bel-Air, where he wrote for the show for three seasons. As a stand-up comedian, Alex has starred in two 1- hour comedy specials “Straight Clownin’” (SHOWTIME) and “Alex Thomas Live” (BET). 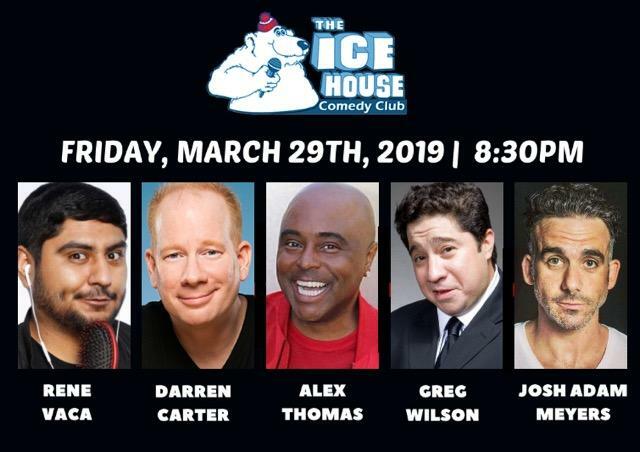 Alex has opened up for such stars as: Sinbad, Jamie Foxx, Mark Curry, Damon Wayans, and Bill Cosby. Stand-up comedy has lead Alex to many television and film roles. Alex played a sidekick role to Jamie Foxx on the hit sitcom The Jamie Foxx Show for three seasons. He has also guest starred on other hit sitcoms, such as: Martin (Fox), Girlfriends (UPN), The Wayans Brothers (WB), Moesha (UPN), The Parkers (UPN), and All of US (UPN). Alex has also done several re-occurring character roles on hit animated series such as: Batman Beyond, King of the Hill, and Family Guy. Alex has also appeared on several talk shows, including: The Best Damn Sports Show Period (FOX), Jay Leno (NBC), and Premium Blend (Comedy Central). In addition, he has appeared in hit films, such as: The Players Club, Two Can Play That Game, Just Married, BAPS, and The Wash, to name a few. Alex is also well known in the hip-hop world from performing in several hit music videos and also several skits on Platinum-selling albums by artists such as: Kanye West, P.Diddy, Snoop Dogg, 50 cent, and Bow Wow. Complementing his entertainment background, Alex is also an avid 13-handicap golfer. He has played on some of the greatest courses in the world from Pebble Beach to St. Andrews. Golf has opened many doors for Alex as he has hosted and played in several celebrity golf tournaments, including: Hall of Famers like: Magic Johnson, Eric Dickerson, and Tony Dorsett. Also, he has played in other celebrity tournaments with George Lopez, Samuel L. Jackson, Will Smith, Nick Van Exel, Antoine Walker, and Alonzo Mourning.